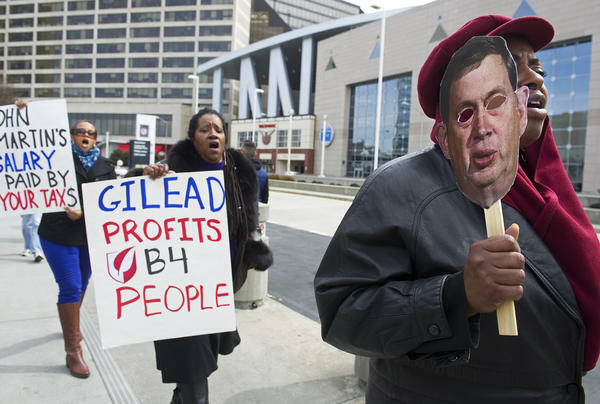 Vicki Reid, right, holds a likeness of John Martin, who was then CEO of the pharmaceutical company Gilead Sciences. Reid and others were protesting high drug prices in front of the conference on retroviruses and opportunistic infections — a meeting held at the World Congress Center in Atlanta in March 2013. In the seven years since the Affordable Care Act was passed, CEOs of U.S. health care companies have made a lot of money. Their compensation far outstrips the wage growth of nearly all Americans, according to reporter Bob Herman, who published an analysis this week of "the sky-high pay of health care CEOs" for the online news site, Axios. Based on corporate financial filings with the Securities and Exchange Commission, Herman did research on 113 heads of 70 of the largest U.S. health care companies in the last seven years. Cumulatively, he says, these CEOs have earned $9.8 billion since the ACA was first enacted. Only four of the 113 CEOs were women, he notes, and only two are right now in charge of major health care companies. The top earner was John Martin, the former CEO of the pharmaceutical company Gilead Sciences, who took home nearly $900 million, Herman says. Gilead makes, among other things, medicines to treat HIV and AIDS, as well as two leading drugs to treat hepatitis C.
Several other executives topped $250 million. Robert Siegel, host of NPR's All Things Considered, spoke with Herman about his analysis. Excerpts of the interview follow, edited for length and clarity. Who are these CEOs and why are they earning so much money — on average, $20 million per year, you say? We looked at a wide array of different companies. They include pharmaceutical companies, health insurers, hospitals, pharmacies — it really spans the gamut. And we found that since the Affordable Care Act went into effect in 2010, their pay has really gone up. So the ACA hasn't really hurt their earnings, per se. And a lot of the money that they're earning is coming in the form of vested stocks. Of course, an underlying issue behind all the talk about Obamacare is not just how we pay for health care and who gets insurance (and in what form) to pay for health care, but how much we pay for health care. What do these CEOs' earnings say about health care costs in the United States? For the longest time, health care inflation has really blown away the rate at which the rest of the economy is growing. And a big reason why is because health care executives are not paid to slow spending. Because so much of their pay comes in the form of stock, their incentive is to do whatever it takes to make that stock go up. So that means selling more drugs; raising prices above inflation; performing more procedures; getting more people into the hospital. And those are the exact opposite things that health policy experts believe would benefit the broader system: lower prices; eliminating unnecessary care and drugs; coordinating better care. But from 2010 (when the Affordable Care Act was signed) through 2015, the Dow Jones went up from under 11,000 to almost 18,000. Wouldn't executives in most sectors of the economy be making huge gains on stocks and stock options during the period that is also the lifetime of Obamacare? The stock market really has been doing quite well since the Affordable Care Act has gone into effect, but the reason why this matters even more for health care is a sixth of our economy is devoted to health care. And that continues to grow more every year. So if the most influential executives of these companies are being paid to keep that trajectory up, that's money that's being taken away from education or infrastructure or other parts of the economy that may not be growing as quickly, and maybe that we'd want to grow more quickly. Can a health care executive argue that the Affordable Care Act brought a lot of people into coverage who haven't had it before? We've heard this anecdotally — that lots of people are getting treatment for things that they were skipping when they couldn't afford it. So, more people are going to the doctor; they're getting more prescriptions. There is some effect there, but that doesn't account for everything. The underlying incentives still really push these companies to do more — even if it's unnecessary. There's still this big issue of all these services that people are getting, are they necessary? And I think that's one of the questions that still need to be answered. Are there any proposals on the table now — either in Republican bills or in Democratic proposals — that would actually reduce health care costs significantly and reverse this trend? In the health care debate right now, none of the proposals in Congress address this whatsoever. A lot of what's being proposed merely tinkers with the financing of health care and who gets health insurance. Nothing is being addressed about drug prices, for example. Nothing's being addressed about the actual costs of the system. The debate right now is still bickering over how to finance the system — not around how much the system itself costs, which I think is a big issue. NPR editors Renita Jablonski and Gisele Grayson, and producer Ian Stewart contributed to this story. In the seven years since the Affordable Care Act was passed, the CEOs of U.S. health care companies have made huge amounts of money. As Bob Herman explains it, their compensation far outstrips the wage growth of nearly all Americans. He just published a survey about this for the new site Axios. He looked at the CEOs of 70 of the largest health care companies in the country. And he found cumulatively, they have earned $9.8 billion since the beginning of Obamacare. And Bob Herman is with us now. Hi. BOB HERMAN: Hi. Thanks for having me. SIEGEL: Who are these CEOs, and why are they earning so much money? You say an average $20 million per year. HERMAN: Yes. We looked a wide array of different companies. They include pharmaceutical companies, health insurers, hospitals. And we found that since the Affordable Care Act was - went to effect in 2010, their pay has really gone up. So the ACA hasn't really hurt their earnings per se. And a lot of the money that they're earning is coming in the form of vested stocks. SIEGEL: Of course, an underlying issue behind all the talk about Obamacare is not just how we pay for health care and who gets insurance in what form to pay for health care, but how much we pay for health care. What do these CEOs' earnings say about health care costs in the country? HERMAN: Right. And I think it's one of the bigger takeaways. I mean, for the longest time health care inflation has really blown away the rate that the rest of the economy is growing. And a big reason why is because health care executives are not paid to slow spending. Because so much of their pay comes in the form of stock, they're incented to do whatever it takes to make that stock go up. So that means selling more drugs, raising prices above inflation, getting more people into the hospital. And those are the exact opposite things that health policy experts believe would benefit the broader system, which is lower prices, eliminating unnecessary care and drugs, and coordinating better care. SIEGEL: But from 2010, when the ACA was signed, the Affordable Care Act, through 2015, the Dow Jones went up from under 11,000 to almost 18,000. I mean, wouldn't executives in most sectors of the economy, not just health care, but executives who are compensated with stock - wouldn't they all be making huge gains on stocks and stock options during the period that is also the lifetime of Obamacare? HERMAN: That's a good point. I mean, the stock market really has been doing quite well since the Affordable Care Act has gone into effect. But the reason why this matters even more for health care is a sixth of our economy is devoted to health care. And that continues to grow more every year. So if the most influential executives of these companies are being paid to keep that trajectory up, that's money that's being taken away from education or infrastructure or other parts of the economy that may not be growing as quickly and maybe that we'd want to grow more quickly. SIEGEL: We've heard so much discussion of how much premium - insurance premiums cost or how many people would be insured or not insured. Are there any proposals on the table now either in Republican bills or in Democratic proposals that would actually reduce health care costs significantly and reverse this trend? HERMAN: If you look - especially in the health care debate right now, none of the proposals in Congress address this whatsoever. A lot of what's being proposed tinkers with the financing of health care, who gets health insurance. Nothing is being addressed about drug prices, for example. Nothing's being addressed about the actual costs of the system. The debate right now is still over how to finance the system, not around how much the system itself costs. SIEGEL: Bob Herman, a health care business reporter for Axios. Thanks for talking with us. HERMAN: Thank you. Transcript provided by NPR, Copyright NPR.